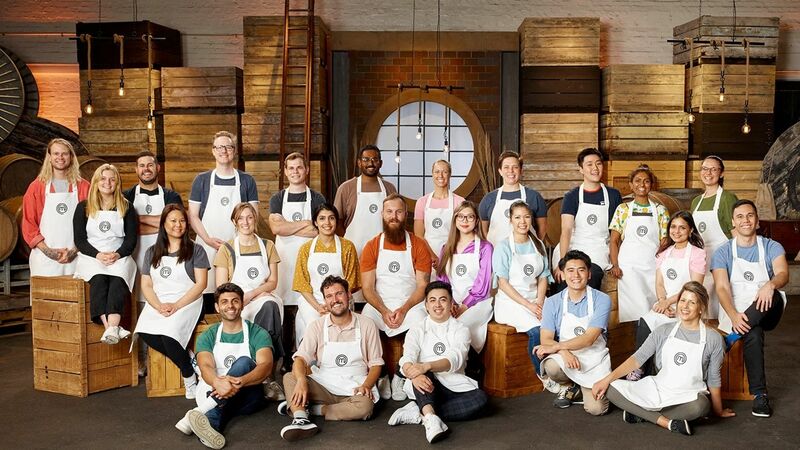 Here's where to watch every episode of MasterChef Australia season 5. Mouseover or tap an episode to see where to stream it. Click or tap the play icon to stream it on the best available service. The Top 22 Jun 1, 2013 22 brand new contestants are introduced as they begin their dream to become Australia's next MasterChef. Protein Pick Face Off Challenge Jun 3, 2013 The female contestants battle it out against the male contestants in a Protein Pick Face Off. The bottom six will go in to the first elimination challenge to take place tomorrow. Elimination Challenge 1 Jun 4, 2013 In the first elimination, the contestants with the worst six dishes from last night's Protein Pick Face Off face an Invention Test with a twist. At the end of the show one of them is eliminated. Masterclass 1 Jun 5, 2013 For the first time ever, there is a twist featuring a studio audience member. Barossa Boot Camp Day 1: Break Down a Lamb Jun 9, 2013 The girls-versus-boys themed challenge continues and they find themselves in the picturesque Barossa Valley instead of the Masterchef kitchen. Barossa Boot Camp Day 2: Maggie Beer Tag Team Race Jun 10, 2013 The second day at the Barossa Boot Camp sees the contestants at the farm of food legend Maggie Beer where each team has to create four Maggie Beer recipes. Barossa Boot Camp Day 3: Seafood at Seppeltsfield Winery Jun 11, 2013 The contestants are challenged at the Seppeltsfield winery in the Barossa, where they meet three seafood champions who show off their skills. Barossa Boot Camp Day 4: Double Elimination Challenge Jun 12, 2013 The boys versus girls Barossa Boot Camp reaches it's conclusion and it is also the final day for two MasterChef contestants. Masterclass 2 Jun 13, 2013 The Barossa Boot Camp comes to an end with a MasterClass featuring great local produce and two of its favourite residents, Maggie Beer and William Wood. Kids Week Day 1: Lunch Box Jun 16, 2013 It's Kids Week and the first challenge sees the contestants having 60 minutes to make the best dish they can using the ingredients that are found in a school lunch box. Kids Week Day 2: Immunity Challenge Jun 17, 2013 It is the first Immunity Challenge of the current series and the judges inform the contestants that they have access to the pantry but there is a catch. Kids Week Day 3: Tuck Shop Challenge Jun 18, 2013 The contestants make their way to Penleigh and Essendon High School where Gary introduces two very special guests who were previous students at the school. The challenge today sees the contestants having to feed 450 starving pupils. Kids Week Day 4: Elimination Challenge Jun 19, 2013 The losing team from the Tuck Shop Challenge faces elimination today. The challenge takes part in two parts which will leave the contestants scared. Masterclass 3 Jun 20, 2013 Masterchef Australia: Masterclass 3 Tonight's MasterClass sees the contestants being joined by Stephanie Alexander and along with Matt Preston, they make a spinach & potato torte. Italian Week Day 1: Public Stall Challenge Jun 23, 2013 It's Italian Week and the remaining contestants are split into four teams and given a dish to create and sell to the public from a stall. Italian Week Day 2: Elimination - Memory Dish Jun 24, 2013 The contestants are given 60 minutes to make a dish from memory. The contestant with the worst dish will be eliminated from the competition. Italian Week Day 3: Battle of the Pizza Jun 25, 2013 The 18 remaining contestants are put into two teams for a supreme Battle of the Pizzas. Each of the teams needs to come up with a menu of four pizzas to feed 150 hungry diners. Italian Week Day 4: Elimination Jun 26, 2013 The team that lost yesterday's pizzeria challenge battle it out in the kitchen but there ends up being a twist. Masterclass 4 Jun 27, 2013 Antonio Carluccio creates Handkerchief pasta with Ligurian Pesto whilst Gary shows how to make the perfect carbonara. Wild West Week Day 1: Catch of the Day Jun 30, 2013 The top 15 find themselves having to to on Wild West Week in Western Australia. They are in Fremantle where they are divided into two teams. They head offshore to catch their own dinner. Wild West Week Day 2: Immunity Twist Jul 1, 2013 The team which won yesterday’s Wild West Challenge battle are out for immunity tonight, or so they believe. After they show up at the Guillaume bistro there is a twist in the challenge. Wild West Week Day 3: Stockmen Challenge Jul 2, 2013 The contestants travel to Kylagh Station in York where they have to create lunch for 20 hungry stockmen and women on limited supplies. Wild West Week Day 4: Elimination - The Green House Jul 3, 2013 During the the Wild West Week elimination challenge, three contestants battle it out at Matt Stone’s restaurant, The Green House. Masterclass 5 Jul 4, 2013 In tonight’s MasterClass, Brendan Pratt cooks slow roasted lamb shoulder with croquettes. Heaven and Hell Week Day 1: Mystery Box Jul 7, 2013 This week's Mystery box challenge pushes the remaining 14 contestants to their limits. Heaven and Hell Week Day 2: Elimination Challenge Jul 8, 2013 Four contestants face the elimination challenge and are joined Ian Curley. The two of them who create the two worst dishes then have to battle it out in round two and one of them will be eliminated from the competition. Heaven and Hell Week Day 3: Seven Deadly Sins Banquet Jul 9, 2013 The remaining hopefuls are divided into two teams, and they have to prepare a banquet for 70 diners using ingredients that represent the different Seven Deadly Sins. Heaven and Hell Week Day 4: Elimination Challenge 2 Jul 10, 2013 The losing team from the Seven Deadly Sins challenge battle it out to try and save themselves from elimination. Masterclass 6 Jul 11, 2013 Paul Wilson creates a traditional Mexican mole with lamb cutlets. The judges pit their skills against one another in creating a chocolate mousse. Fast Food Week Day 1: Mystery Box Jul 14, 2013 Fast Food Week gets underway and in the mystery box challenge the twelve remaining contestants are split in four teams, each having to create their own creation of the burger, fried chicken and kebab. They have to face the clock though as time is limited. Fast Food Week Day 2: Auction Elimination Jul 15, 2013 The elimination challenge sees the contestants having to bid against each other for the items they want to cook with in an auction, and instead of money, they’ll bid with minutes. Fast Food Week Day 3: Car Club Team Challenge Jul 16, 2013 The remaining contestants travel to Red Hill Estate on the Mornington Peninsula where they have to create club sandwiches for 50 car club fans. Fast Food Week Day 4: Elmination Challenge Jul 17, 2013 Daniel Wilson offers his 'perfect hotdog'. The contestants facing elimination have to recreate the hotdog and David will join the judges to decide who will be eliminated. Masterclass 7 Jul 18, 2013 Gary attempts to prove that fast food can be healthy as he creates Vietnamese Rice Paper Rolls with peanut dipping sauce. Immunity Week Day 1: Skills Test and Yin & Yang Challenge Jul 21, 2013 Only 10 hopefuls remain in the running and with an immunity pin up for grabs, the tension in the kitchen is running high. Immunity Week Day 3: Black Forest Ice-Cream Cake Relay Jul 23, 2013 The remaining pairs in the immunity challenge have to recreate Nick Palumbo’s black forest ice-cream cake, in a relay style event. Immunity Week Day 4: Butter Invention Test Jul 24, 2013 With just four pairs left vying for an elimination pin and in an invention test each couple has to create a sweet and a savoury dish. Masterclass 8 Jul 25, 2013 Matt goes back to basics as he creates a homemade tartare sauce. Gary uses some fresh local produce to create a dish for some local lifesavers. Love Week Day 1: Mystery Box Challenge Jul 28, 2013 Love week gets underway and starts with a mystery box challenge. The remaining hopefuls get to fill their own boxes with ingredients of their choice but there is a twist! Love Week Day 2: Chocolate Elimination Jul 29, 2013 The ingredient in this week's pressure test is chocolate. The bottom three from yesterday's challenge have to recreate Kirsten Tibballs’ louros cake. Love Week Day 3: 50 First Dates Jul 30, 2013 The top 10 are split into two teams and given the challenge of creating a main dish and a dessert for 25 couples. Love Week Day 4: Breakfast Elimination Jul 31, 2013 The five contestants facing elimination this weekhave to create their own breakfast dish and then serve it in just an hour to 100 hungry customers. Masterclass 9 Aug 1, 2013 Kirsten Tibballs shows how to make an indulgent chocolate dessert perfect perfect for sharing. Gary creates a gorgeous dessert to tempt your loved one. Heston Blumenthal Week Day 1: Royal Jubilee Trifle Aug 4, 2013 The judges are joined by Heston Blumenthal and the contestants have two hours to recreate Heston’s royal jubilee trifle as they battle it out to win immunity. Heston Blumenthal Week Day 2: Cook Against Heston Immunity Aug 5, 2013 The three winning contestants are given just 90 minutes to cook either an entrée, main or dessert while Heston has to cook all three courses in the same time. There is a twist in the challenge though. Heston Blumenthal Week Day 3: Medieval Knights Feast Aug 6, 2013 The teams have two and a half hours to create a Heston-esque medieval feast for ten noble knights and the judges. Heston Blumenthal Week Day 4: Elimination Challenge Aug 7, 2013 The contestants from the losing team batle it out in today’s elimination challenge. Masterclass 10 Aug 8, 2013 Heston offers a masterclass on how to create perfect scrambled eggs. He also creates a roasted leg of lamb with anchovies and rosemary and demonstrates how to carve for maximum flavour. World Food Week Day 1: VIP Banquet Aug 11, 2013 The remaining eight contestants are flown to Dubai and split into four teams of two the contestants to face a challenge that sees them shop in the local Souk Markets and then create a banquet to 36 VIP's. World Food Week Day 2: Palms Hotel Elimination Aug 12, 2013 The 6 losing contestants from yesterday’s challenge are put in charge of the Ossiano kitchen at The Palms Hotel Atlantis, where they have to create dinner for 50 VIP Atlantis guests as well as Ossiano Vice President, Mark Patten. World Food Week Day 3: Mexico or China Aug 13, 2013 The contestants are split into two teams and have to create a lunchtime menu for city based office workers in Melbourne composed of dishes from either Mexico or China. World Food Week Day 4: Qantas World Map of Food Aug 14, 2013 The contestants find themselves standing in front of the Qantas World Map of Food. They then have to create dishes from various regions of the world. Masterclass 11 Aug 15, 2013 The two lucky contestants who won Sunday night’s challenge are flown first class to Paris where Matt Preston shows them some of his favourite places to eat. Dreams Week Day 1: Service Challenge Aug 18, 2013 The seven remaining contestants begin to realise that their food dreams are a real possibility. The service challenge sees them having to create dinner for some very surprise guests. Dreams Week Day 2: Elimination Challenge Aug 19, 2013 Those facing elimination need to create cook a plate of food that demonstrates their food dream. Dreams Week Day 3: Josie Bones Aug 20, 2013 The final six contestants pay a visit to Josie Bones, a restaurant owned by Chris Badenoch, who was a former Masterchef contestant. They are split into teams and have to create three dishes to serve to Chris' customers with the worst team having to face the next elimination challenge. Dreams Week Day 4: Darren's Raspberry Rhubarb Ginger Chocolate Dessert. Aug 21, 2013 The contestants facing elimination have to try and replicate Darren Purchase’s, raspberry rhubarb ginger chocolate dessert. Masterclass 12 Aug 22, 2013 Annie Smithers and John Reid are with the top five contestants & the judges, to create some great regional country produce. Finals Week Day 1: Mystery Box Aug 25, 2013 The latest mystery box challenge sees the contestants being given 10 ingredients, five chosen by the contestants and the other five chosen by the judges. They then have just sixty minutes to create a delicious meal. Finals Week Day 2: Elimination Challenge Aug 26, 2013 The five contestants are matched with a chef that has a style and expertise to match their culinary ambitions in the latest elimination challenge. Finals Week Day 3: The Atlantic Service Challenge Aug 27, 2013 The four hopefuls left in the running arrive at Donovan Cooke’s restaurant, The Atlantic. Each of them have to create a two course meal chosen by Donovan for some VIP Atlantic customers. Finals Week Day 4: Culinary Dueling Aug 28, 2013 The hopefuls battle it out in a culinary duel over three different rounds. In eachround, they have just thirty minutes and an open pantry to try and come up with their winning dishes. At the end of the show there is another elimination. Masterclass 13 Aug 29, 2013 All of the contestants from this year's competition return to take part in the last Masterclass of the season. The tables are turned though as they set a mystery box challenge for George and Gary. Grandfinal Sep 1, 2013 The finalists battle it out to secure the $100,000 cash prize, an Alfa Romeo Giulietta, a cookbook deal with New Holland and access to Australia’s best kitchens.